Last weekend I went to Padstow. This fishing port is best known for its association with Rick Stein, who appears to own half of the businesses in the town from his eponymous restaurant, fish & chip shop and deli to a local pub, bistro and patisserie. Predictably there was no space for a last minute booking at his restaurant. We were told that we might be able to eat there if we tried our luck at the bar without booking. The menu looked great but the uncertainty wasn’t what we were looking for. So we decided to try out Stein’s Fish & Chip shop, the following day. I’ve been there before and remembered that the food is great. Good chunky chips, fresh salad and a wide range of grilled and battered fish. But what about the sustainability of the fish we were eating? There were no signs anywhere I could see telling customers what the policy was. So we asked the Polish waitress whether the fish had been sustainably caught. Not surprisingly, she didn’t understand the word ‘sustainable’. A lady from behind the counter overheard. She shouted across that the cod was from ‘sustainable sources’. We wrote the word ‘sustainable’ down for our Polish helper and tried to explain what it meant. But she didn’t get much help from her colleagues except to say which fish had been locally caught. Most but not all of it. The ‘sustainable’ cod came from Iceland, I think. The sea bass was farmed – which is quite common. And there was no information about the skate and the monk fish, which are the two species I know to be particularly vulnerable. ADVICE: The common skate belies its name as it is becoming very rare in UK shallow seas and in European waters. Common skate is assessed as Critically Endangered by IUCN -World Conservation Union. Avoid eating. Monkfish advice is a little less categorical: Monk or anglerfish are a long-lived species and have low resilience to fishing. Avoid eating fish from the depleted southern stock. To help increase the sustainability of fish eaten from healthy stocks, ensure fish is above or equal to the size at which it matures – at least 70cms – and avoid eating during its breeding season – spring and early summer. Surprisingly, if you look at Rick Stein’s website, he talks about sustainable fishing. 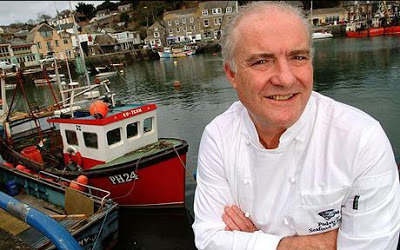 And in 2006 the Sustainable Fish Summit was held at Rick Stein’s cookery school in Padstow. So why not say something about the issue in his fish and chip shop? Given that Stein’s name has become almost synonymous with fish, I think this is a huge failure. Even the Food Standard’s Agency is advising consumers to make ‘informed, sustainable choices’ and to ‘choose fish that has been produced sustainably or responsibly managed’ as well as to look for ‘assurance scheme logos’. I try hard to do this – and often ask at the restaurants or hotels I go to about their policies. But it’s unusual to get a well-informed response. Many think that ‘locally caught’ is synonymous with ‘sustainable’ but it’s not. Back to my fish and chip lunch – remembering advice from Charles Clover’s excellent film ‘End of the Line’, and from Hugh Fearnley-Whittingstall’s TV series on fish, I thought I look for an alternative to cod or haddock, like pollock. It wasn’t on the main menu but luckily was a special for the day. And it was truly delicious. Next time I’m in Padstow, I’ll make another visit and hope that things have changed. Sustainable fish policies should be easy to see, easy to understand and promoted to the public. If not then we’ll be lucky if there’s any fish left for us to eat and Rick Stein will be out of business – or at least his fish business. This entry was posted in Campaigning, Food & drink, News 2009 and tagged Meat & Fish. Having left one comment on your blog, just now, how could I not leave another? I'm on a roll as they say. I was interested in the sustainability issue that you raise in this and other posts that I have read now, but it rubs both ways does it not? How sustainable is your blog, for example? How efficient is your computing? Is this the kind of question we should be allowed to ask you, given your views on whether we should even send Christmas Cards. Well, I'll ask it again, anyway. Is your computing "Efficient Computing"? As one web company states (quite openly) 'Servers use a lot of energy currently estimated at 2-3% of the US total.' They can state this openly because they chose, apparently, not to contribute to this figure through inefficient energy use. But what about the server on which your blog is held? And your other website? It's probably not a question anyone should expect you to be able to answer straight away, but it might be worth looking into. Put simply, does your provider minimize the number of servers they require to deliver all those websites they host? Are you happy with their performance? What criteria do you use to assess it? If you find you are not happy, what will you do? Specifically, what about the energy used by the company that serves up your websites? Is it electricity purchased from the grid? Is it 'clean energy'? Is it 100% renewable energy? Do they have a Recycling/Re-Use E-waste policy? Will they (can they) even tell you? Do they want to? Do you now need to know? The more I read your blog, the more questions I find keep popping up in my head. Is Rick Stein's fish sustainably sourced or not? Is your blog? They are both valid questions. Only one, as far as I can see, has so far been answered. PS: You forgot to credit the photograph of Rick Stein to UK-based photojournalist Christopher Jones. That's an ethical issue too.